His expertise and drive to never stop perfecting the art of dentistry have driven him to great honors in the dental field. He has been awarded his Masters through the Acedemy of General Dentistry. This particular accomplishment is only bestowed on dentists who continue their education through a strict testing and comprehensive program. Dr. G'Sell is also a member of the American Dental Association, Missouri Dental Association, Greater St. Louis Dental Association, Invisalign Orthodontic Certification and American Equilibration Society. The American Equilibration Society alone is a commitment of continued education in the field of TMJ treatment. Dr. G'Sell is well versed in the ability to treat and maintain proper jaw joint health. He personally fabricates appliances custom made to each patient in need and provides constant care in order to restore proper alignment, function and care in respect to the TMJ. 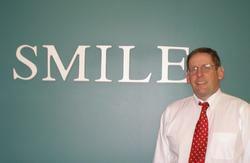 Dr. John G'Sell is also an Invisalign Orthodontic dentist. He is certified to provide orthodontic treatment for the straightening of teeth in the office through the process of clear aligner appliances. This treatment has been very popular with our patients wanting to improve the look and functionality of their smile. He provides treatment for general, reconstructive and aesthetic dentistry for the whole family. Please call or email today with any questions concerning what Dr. John G'Sell can do to create a beautiful smile for you.